SHANGHAI — Lexus will pioneer a fresh premium segment with the LM 350 people mover van, an entry trying to tap burgeoning demand for palatial limousine transport in Asia by luring industrious high rollers with thrown-like seating in an on-the-go office space. The roomy LM, unveiled Tuesday at the Shanghai auto show, responds to the needs of Asia’s increasingly affluent “next generation of luxury consumers,” Lexus said. And in case anyone doubts its premium credentials, Lexus promises the upcoming nameplate will get the “largest ever Lexus spindle grille” with chrome accents galore along its side. Among other accouterments: A 26” color screen, refrigerator, umbrella storage, massage chairs and glass privacy partition. The minifridge can chill two champagne bottles, Lexus notes. Don’t expect the new Lexus LM in the U.S. anytime soon. Toyota Motor Corp.’s premium brand says the Lexus van will be offered first in China and select Asian markets. MPVs are gaining popularity throughout the region as a chauffeured vehicle for the jet set, thanks to their easy egress, standing room, spacious interiors and comfortable captain’s chairs. 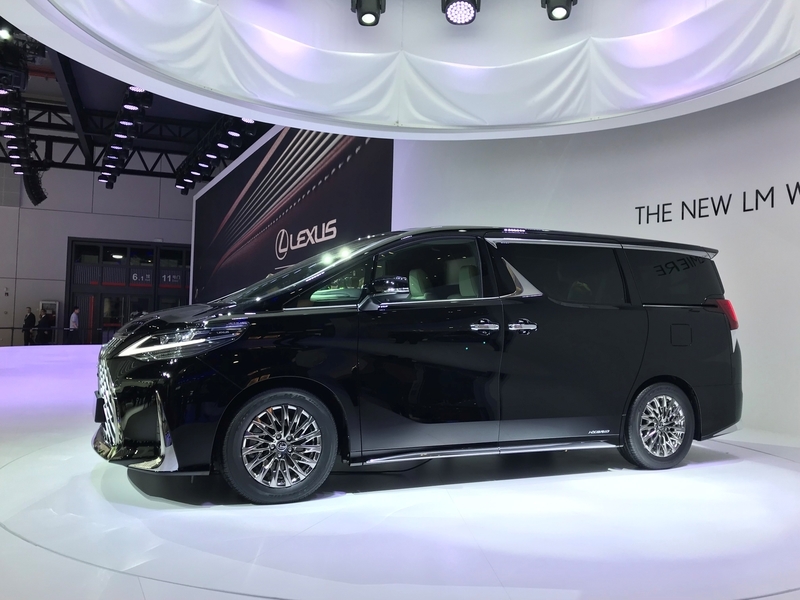 In Japan, Toyota-badged vans called the Alphard and Vellfire are already popular among politicians, executives and celebrities, who increasingly eschew traditional three-box sedans. The LM will share basic underpinnings with those vans. The Lexus entry will be available only in white or black. In addition to the standard seven-seat configuration, the LM will offer a four-seat layout with two “thrown-style” rear seats. The LM will be optioned with either a 3.5-liter gasoline engine or a hybrid setup paring a 2.5-liter Atkinson-cycle four-cylinder with an electric motor, the same used in the ES hybrid sedan. The suspension of the front-wheel-drive vehicle is tuned for comfort. And the seats are cooled using suction ventilation that draws climate-controlled air through their surface.